Chamber of commerce ASSISts with mural along SW 9th St.
Mural is created as a work of art to bring the neighborhood together. 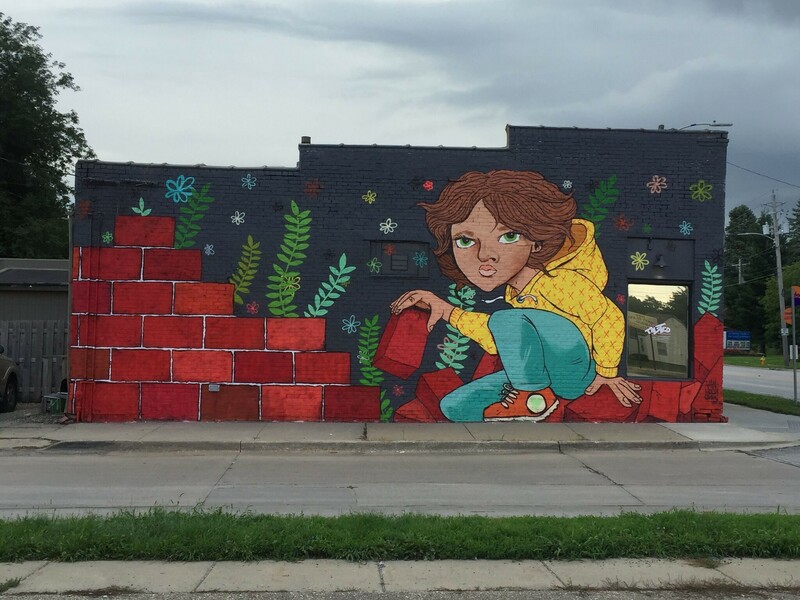 DES MOINES, IA – The Des Moines East and South Chamber of Commerce is proud to assist in staffing the efforts in making a community mural on SW 9th a reality. The mural is located on the side of the Twisted Pizzaria building, between Park and Watrous on SW 9. Made possible by the funding of the Neighborhood Finance Corporation and Neighbor Works America ®, this vibrant mural was created to help enhance this historical corridor on the South side of Des Moines. “Neighborhood Finance Corporation is excited that through our partnership with NeighborWorks America® we have been able to be a sponsor the mural project and be actively engaged in the improvements on the SW 9th Street Corridor,” said Stephanie Preusch, NFC Executive Director. Stephanie along with others in the community, John Cacciatori, Chris Aldinger, Bill Hansen, Tricia Rivas and Chamber President/CEO Sadie Trytten, attended a conference in Cincinnati in fall of 2014 to decide on a project to complete. In February of this year Neighborhood Finance Corporation supplied the Friends of SW 9th with the remaining grant money to make this community art possible. 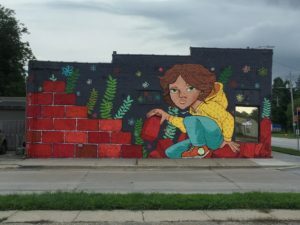 The objective of the project was to work with local artist Van Holmgren and create a vibrant and colorful mural on a building along the Southwest 9th Street, a corridor in Des Moines that has been greatly enhanced recently by community partnership and the leadership of the Friends of SW 9th. “I’m excited for everyone that travels on that road to see the mural. I remember being a little kid and looking with awe at other murals. The mural is less literal with its message to the viewer. It obviously depicts a young girl taking down the bricks from a wall that reveals some plants and flowers in various colors. What you do with that visual information writes your own take on the mural. The Friends of SW 9th is a community coalition of 24 organizations dedicated to enhancing the corridor through implementing a strategic plan, community events, and enhanced communication. Their mission is to enhance the corridor’s role as the Southside’s main street that serves as a gateway to community attractions and downtown, while preserving the area as a place of residence, commerce, and community. The Des Moines East and South Chamber and Sadie Trytten have been deeply involved with the SW 9th project from the start and the addition of the mural to this area served as an ideal opportunity to collaborate with community leaders and a passionate artist to further beautify this area. For more information on the East and South Chamber of Commerce, visit here. The Des Moines East and South Chamber of Commerce is a private, not-for-profit business member organization aimed at fostering economic development and growth of member businesses and the Des Moines community. The Chamber offers a broad spectrum of benefits and services to its members. For more information about the Des Moines East and South Chambers of Commerce, please visit www.dsmeastsouthchamber.org.